Ce chalet de luxe est situé dans le cœur de Franschhoek entre les vignobles. Il est à distance de marche de plusieurs restaurants, boutiques et galeries. "Chenin cottage 'a un beau jardin privé avec terrasse, cuisine et salon avec une buanderie séparée. Il ya deux grandes chambres (un lit king-size, de deux lits simples) et deux salles de bains avec WC, douche et baignoire. De le salon donne sur la piscine rafraîchissante et est idéal pour profiter de l'été avec vos amis et famille. En bref, un chalet luxueux et très bien rangé qui est parfait sera venu à ton repos dans un bel environnement, unique. Thank you so much. It was lovely having you staying in Chenin cottage again. Well, seeing the picture popping up for this review turns me home-sick immediately! We've had a wonderful stay at Maison Chenin, we were fortunate to spent 3 months in Franschhoek in the 2017 'winter' season of South Africa. The days were actually very sunny, most of the time, at night it could get a little chilly. But, this was a very mild winter, with hardly any rain or wind. The house is very charming, lovely decorated with a warm and cosy atmosphere. One will feel at home right away. Margot and Jules had left us with a well prepared welcome, the refrigerator and kitchen cabinets were filled with milk, snacks, pasta, a bottle of wine, etc. Margot has a map with lots of suggestions of what one could do or where to go, we've visited quite some restaurants on her advice and loved it. Enjoyed our last dinner at Marigold, wonderful indian cuisine in Franschhoek. 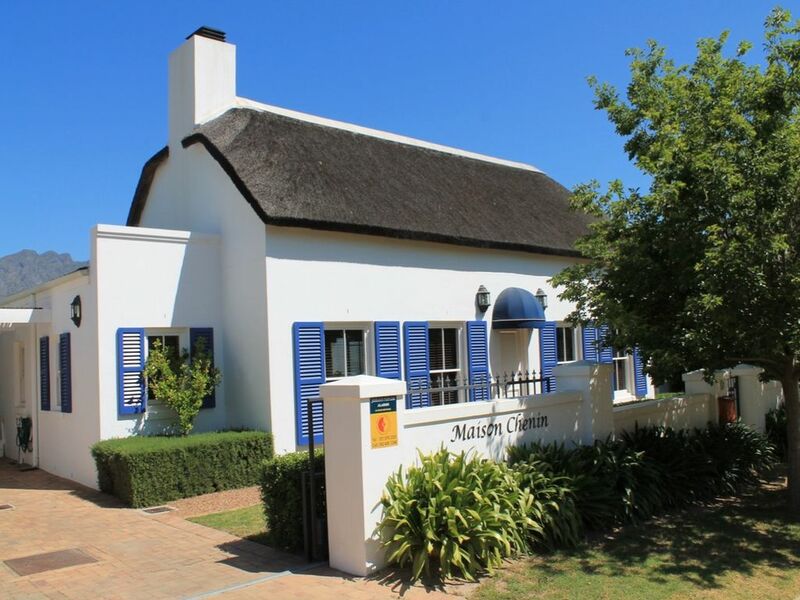 Franschhoek knows quite a few galleries, shops, lovely restaurants and of course, beautiful wine estates. Staying in South Africa is a treat, a joy, and if one stays at Franschhoek, Maison Chenin will complete this feeling perfectly. The house is comfortably equipped with the necessary tools, as is the kitchen, though one will probably prefer to have dinner in one of the surrounding restaurants. were having breakfast or enjoying a braai will complete your day. Thank you Margot and Jules, we had a wonderful time! Thank you very much for your great letter. We are glad that you enjoyed staying in our Chenin Cottage in Franschhoek during three months. You were wonderful guests and we hope to see you back next year! We can't wait to go ourselves in October. Wat een smaakvol ingericht knus huis met heel veel privacy, goed beveiligd. Het huis is van alle gemakken voorzien de ligging is perfect lopend naar het prachtige dorpje met zijn heerlijke restaurants. De omgeving is prachtig. We hebben nog gebruik gemaakt van het appartement in Kaapstad van dezelfde eigenaren de combinatie is een dikke aanrader. Nogmaals in een woord geweldig! Besser geht es nicht! Wunderschön, gepflegt, voll ausgestattet. Sehr gut eingerichtet. Wir würden es nicht gerne weiterempfehlen, sonst kommen Andere!! Wir kommen wieder! Margot ist bezaubernd. Dear Bernd and Claudia,it was very nice meeting you! Thank you very much for all your kind help with everything! I am glad you booked again for next year. You were wonderful guests!!! Chenin Cottage is beautifully furnished, well equiped and maintained. The lounge/dining room is double height with an African theme, very impressive and at the same time comfortable and functional. Bedrooms of equal size with very nice en-suite bathrooms and nice fluffy towels. Pool is well situated and we swam in it every day of our stay. Highly recommended. When the cottage is not left behind reasonably clean we will charge € 50 cleaning costs.